Notes: This dress is knit from the top down and uses a bit of shirring in the bodice to ensure a good fit. The bodice is done in dot stitch, which reminds me of a flower center. The top of each "petal" in the skirt has slip-stitch and eyelet detailing. 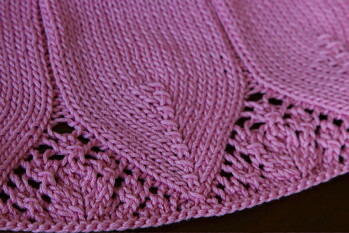 The petal tips and lace inserts are adapted from the Hemlock Ring Blanket. Additional sizes added on 6/13/08. Edited 6/24/08 to correct error in Chart A. Round 1: *P1, k1; repeat from * to end. Round 3: *K1, p1; repeat from * to end. Repeat rounds 1-4 for pattern. 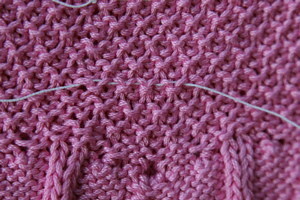 Using shorter circular needles and cable cast on, CO 88[100,110,122,132] sts. Place marker and join to begin working in the round, being careful not to twist. Work dot pattern for 4[4.5,5,5.5,6.25] inches, ending with round 1 or round 3. *P1, k9 tbl, p1, repeat from * to end. P1, k9, p2tog, *p1, k9 tbl, p1, repeat from * to end. Work Chart A 8[9,10,11,12] times across sts (click for larger image). 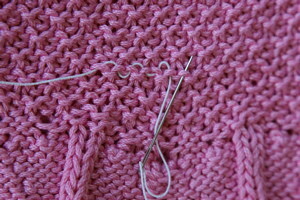 Switch to longer circular needles after completing row 1. Repeat row 11 of Chart A till work measures 10[11,13,15,17] inches from cast on edge, or until desired length before transitioning to lace section (lace section will be 3 inches in length). Work Chart B 8[9,10,11,12] times across sts (click for larger image). Next round, knit across all sts. Cut 5 16[18, 20, 22, 24] inch strands of elastic thread . Turn garment inside-out. 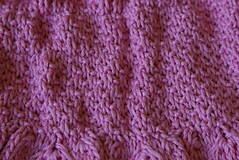 Starting with the 2nd row of purl bumps from the top, weave elastic under purl bumps as shown. Tie square knot in elastic, leaving 1-1/2” tail on both ends. Repeat using remaining strands of elastic thread, distributing the rows of elastic evenly over the length of the bodice. Try garment on. Adjust elastic thread if necessary to ensure comfortable fit. Trim ends. Dab Fray Check onto knot and elastic thread ends; weave in ends. Sew ribbons into place for straps. It is wonderful and dreamy -- a dress that any little girl would adore! And you nailed it when you said it's easier to read a pattern than write one. Beautiful Dress----I want to make one for my new neice coming soon----any recommendations for making it smaller? I am fairly new to knitting, but I think I could do this! Very beautiful! Going to have to make this for my daughter. Thanks for the pattern! OMG!!!!! I love this dress, my sister is having a little girl soon. So, hopefully by the time she get this age I'll have obtained more knitting experience than the purl stitch that I know Now. Thanks for shring. I think you should try to get this pattern publish, for sure. I've run into a problem on Row 10, Chart A. I'm guessing the symbol "O" is a yarn over. But I end up with an extra stitch before and after the slipped stitch that goes down the center of the "petal" on the needle. Should I be doing some knit togethers here somewhere? Thank you for pointing that out, Pam! I've uploaded the corrected chart. I love this dress, but my little girl is a size 7 going on 8 (26 inc chest and 23 1/2 inc waist). Any ideas of what I can to to enlarge this pattern? I've never attempted to make a pattern larger or smaller. This is amazing! Totally fabulous, and so are you for sharing such a lovely creation for free! Thanks so much for your generosity and congratulations on your creative pattern. 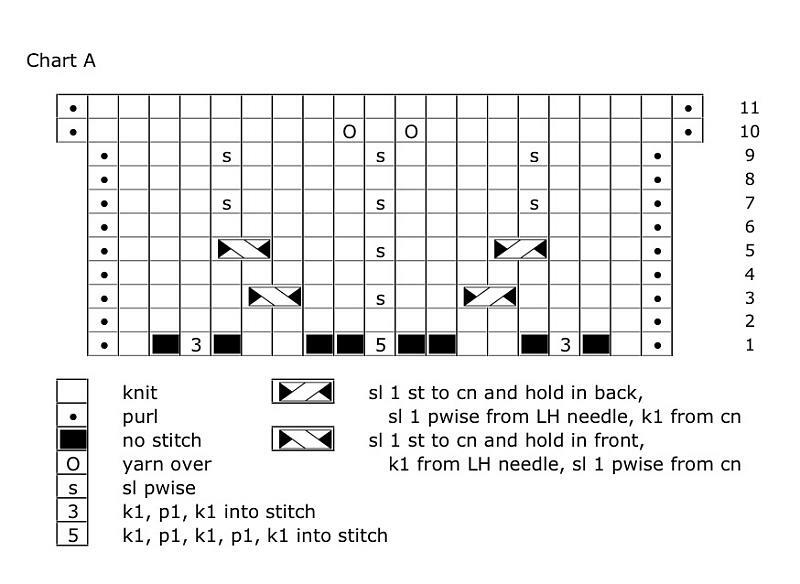 Could someone help me, i am just starting to knit and i don't understand, chart A says to knit eleven times across the points but 11 times 19 is 209 points. Am i being a real dummy? I assume you are making the 4 year old size? For that size, you start out with 122 stitches. In the row just before starting the skirt, you do a p2tog, which reduces the stitch count by 1: now you're down to 121 stitches. When you begin row 1 at the bottom of the chart, keep in mind that the black squares represent areas where there is no stitch. If you count the other squares, there are 11 of them. So you're really working 11 stitches 11 times, for a total of 121 stitches. As you work that first row of the chart, though, notice that there are some 3's and 5's. Those are stitches in which you'll work some increases, so that the total number of stitches will increase to 11x19 = 209 *after* you've finished the row. I hope that helps. If not, email me at vysews@yahoo.com. Good luck! This is a beautiful dress. I'm inspired to use it to make an adult sized top, either with the dot pattern on top or just on top down sleeves. Thanks for posting the pattern. Oh good! I'm glad you figured it out, Christina. If you need anything else email me at vysews@yahoo.com. I'd love to "see" it when you're done! to do line 2. You read the chart from right to left. that lacy stuff in between. The chart is lined up like that to help you visualize how the stitches relate to one another. For example, all of the double decreases (V's) are lined up with one another in the chart because that's how they'll look to you as you work the knitted fabric. Email me at vysews@yahoo.com if you have any more questions. Good luck! 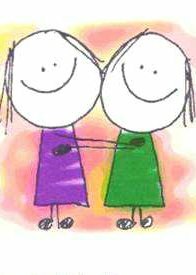 This is SOOO ADORABLE! Thank you for your generosity. Thank you so much for this pattern! Absolutely adorable! I just finished the dress and my daughter LOVES it. It fits perfectly (size 6) and the pattern was easy to follow. I find it amazing that you can come up with something like this - and that you simply let others use it for free. Thank you again. You can see the finished dress in ravelry.com (my username is CreativeToyshop). Please help! Am trying to print the instructions to the Flora dress, which is possibly the most beautiful knitted garment I have seen. All that prints are two pictures and the graphs? I do hope you can help. Thank you! Congratulations on being so artistic and many thanks. Hi I just finished a size 2. I believe this will be a favorite pattern. Real simple to knit. I am change the knot for the elastic. the square knot may not hold up in the wash. 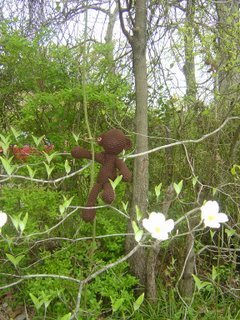 I'm using "Figure Eight, or Flemish" climbers use this to join rope. I am trying to knit the Fora dress for my granddaughter. I have a question regrading the instructions in Chart A. What do you mean when you say "no stitch" and what do you mean when you say "sl 1 st to cn"
This is gorgeous!!! I'm only a beginner knitter, but I'm getting typically carried away, and am planning all sorts of projects for my friends' kids (there's only so many jumpers I need) - there's one very girly little two year old who is going to be over the moon if I manage this - thank you so, so, much for sharing! ps found you via Ravelry. Cool post as for me. I'd like to read something more about this matter. Thnx for sharing this data. I just came across this dress on Ravelry - and it's beautiful...I would love to make it for my niece. I've never worked with Charts so I have a few questions: In Chart A, what do you mean when you say "no stitch" and what do you mean when you say "sl 1 st to cn"; also for the life of me I can't think of what "tbl" abbreviation is. Thanks so much. The first time I saw this pattern was in 2008, when I didn't know how to knit. I've crocheted for years. I so wanted to learn to knit just so that I could make your dress. I knit now, so I am happy to say that I get to knit the dress that you have so generously shared! Hi, Andrina. Sorry for the late reply--I wasn't getting comment notifications for awhile there. The "no stitch" squares are used just to make the chart line up better. You just skip over them. "tbl" means through the back loop. Email me at vysews@yahoo.com if you have more questions. Good luck, and thanks for the interest in the pattern! I know this pattern has been up for awhile, but have you ever tried to knit in the smocking rather than thread it through after the fact? I haven't Janet, but it's a good idea! I'm going to do the top with Bernat baby stretch which should look similar to the top pattern and then sew it to a woven fabric skirt. I've seen smocked dresses like this and would like to simulate the smocking with the knitted top. What do you think? Any changes suggested for doing this? Hi! This is my first project with charts, and i was wondering when it said to repeat the chart 8 times, is that eight times of each row after one another or eight times of the whole chart? Hi, Kayla. You'd work row 1 8 times across to finish off the round. Then you'd work row 2 8 times across, etc. Good luck! Oh so Cute! I've got to knit this soon since upsizing to a 7 yr old is just a tiny stretch from size 6. I am making this gorgeous dress for my niece. I'm not THAT new to knitting but new enough... and I can't figure out what you mean by "slip 1 stitch to circular needle (is this a third needle? ), sl 1 pwise from LH needle, K1 from cn < if this isn't from the third needle then I am at a complete lost! I know this post is old, I hope you can still help! Hi, Chantal. Yes, the cable needle is a separate 3rd needle. There are some different shapes available, but if you already have double-pointed needles, you can just use those. You can also learn to do cables without a cable needle. I am still confused by the "no stitch." What is it you skip over? 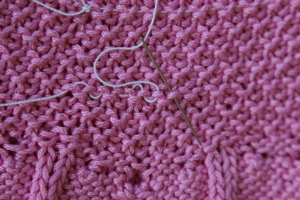 Do your transfer the stitch from the left needle to the right without doing anything else with it? Hi, KarenMitchell. A "no stitch" symbol is used as a filler on charts when there is a different number of stitches on each row. It helps the chart line up better visually. For the purpose of reading the chart, you just ignore it and move on the the next symbol. p1, k1, [k1,p1,k1 into stitch], k2, [k1, p1,k1,p1,k1 into stitch], k2, [k1,p1k,k1 into stitch], k1, p1. 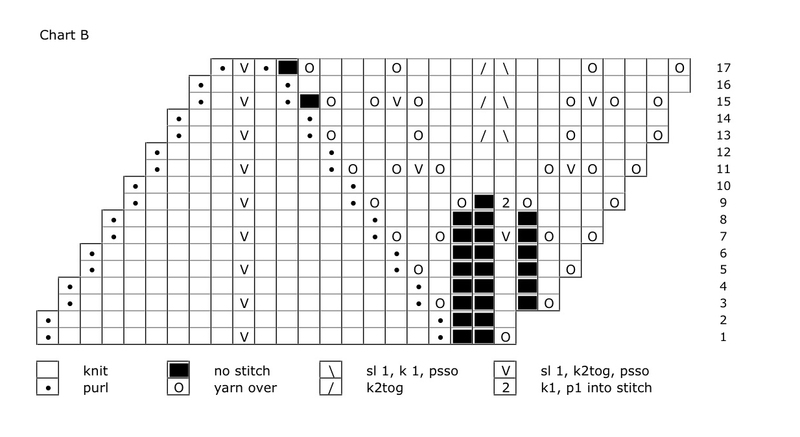 Here's a little tutorial from knitty that further explains the "no stitch"
p1, k8, yo, k1, yo, k8, p1. Atfter completing row 10, you'll have 21 sts. You'll continue the 21 sts for row 11 and on to the start of chart B.
Loving this pattern but looking for some help on chart B. I am confused how it works when working in the round using iterations. 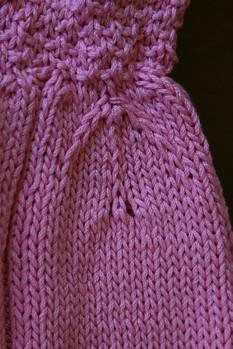 I have knitted the first two rows and I just cannot get the stitches to line up. row 1 I did the sl, k2t, psso in the middle and then YO to add a stitch between the two Purl stitches. Row 2 knitted the YO stitch for the previous row. However after knitting the YO stitch ( last stitch ) on row 2, I am looking to start row 3 but my purl stitches still line up. So if I did a Purl as the chart says my purl stitch would be on top of my row 2 purl stitch and there would be no slant. I think to clarify this I need to know, on line 3 what stitch should be before the first purl ( above row 2s purl) , on the chart it is not included. I hope someone can understand this, thanks so much to anyone offering help. Anonymous, I wonder if part of the confusion is the order in which you're reading the chart? The chart would read just like your stitches "read" when you're looking at them from the front. I'm wondering if you're reading the chart from left to right? When knitting in the round, all rows should be read from right to left. That's it thank you so much. I was reading the chart the wrong way. Worked it out now Thanks so much. I just finished this dress for my daughter. It is gorgeous!! Can this be coverted into a skirt when she outgrows the dress? Thank you for making this pattern free! I'm stuck on line 16 of chart B. it calls for 18 knit stitches, but I only have 16 from line 15. Can you help? 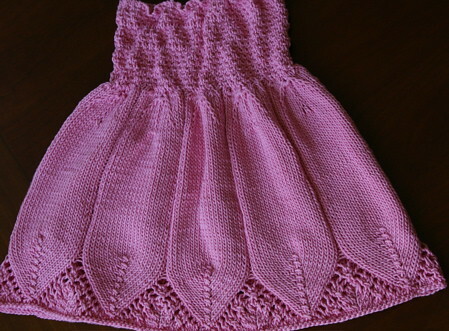 I loved knitting this dress for my granddaughter's first birthday. I completed the project within the week. I found it an easy pattern. My TIPS are: use markers when completing the bottom part of the pattern. It's easy to not have enough stitches with all the YO's in the pattern. When I used the markers I could catch my mistake very quickly. Thanks for the great pattern. Just finished making it for my one daughter. I sent the pattern to my grandmother and now she's going to make one for my other daughter, she loved the pattern too, and has already made a small one and started the second for my youngest twin cousins. Stunning dress! i would love to make this for my neice but i am a self taught knitter and cannot for the life of me read charts. hopefully one day i will be able to wrap my head around it and be able to make this. Just about to start knitting my niece this dress. Instead of ribbons on the shoulder straps, I'm going to knit tubes and put elastic bands into the tubes and sew them on! I love the dress absolutely beautiful! Is there a mistake on row 16 of chart B? I got 16 sts for the lace part and it says 18. It looks like even with it like this it would work out for row 17. Thank you! Might have hastily commented, row 17 of chart B did work out, so unless I am missing something there is a mistake on row 16. Not a big deal or anything, just surprised no one mentioned it! Thanks for sharing this lovely pattern. I'm working on knitting this dress at the moment. Thanks for posting such a beautiful pattern. And thanks to all the previous knitters who have asked, I think, all the questions I needed answers to! hi !! and thank you for the pattern. I'm francophone but i generally use english patterns in knitting. but i find this pattern difficult to understand so i've not understood what does mean no stitch on the chart ? please can you help me ?? ?